I didn’t get quite as much sleep as I would have liked to start my first full day in Finger Lakes, but I was not about to let it get me down when I had such a great schedule ahead of me. Meg from the Finger Lakes Visitors’ Center picked me up in Canandaigua bright and early, immediately improving my mood with a stop at the South Bristol Overlook. It was the first of many breaktaking views of lakes, mountains and valleys I was to see here and, even though I would have been content to explore it all day, I had wine to get to. The first winery of the day was a perfect choice. It was only 9:00 am so my mind wasn’t quite in tasting mode, but Tim and Diane quickly changed that in their laid back winery where they told me “we wanted to imagine more in life.” Each bottle is a journey, not just by its name, but in the creative quotes and unique etches of their children on the bottles. 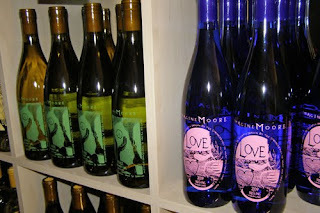 It all started – appropriately – with “Love,” Imagine Moore’s semi-dry Riesling, their most popular offering. It continued with Bliss (Sauvignon Blanc), Peace (Pinot Gris), Joy (Riesling), Change (Blaufrankisch), Wisdom (Cabernet Franc), Synchronicity (a Syrah/Cabernet blend), Truth (a blend of four reds) and Inspiration (a mystery blend of two reds). Gratitude is their popular white table wine. The latest version – just bottled – is a chardonnay and Sauvignon Blanc blend that was lightly oaked. 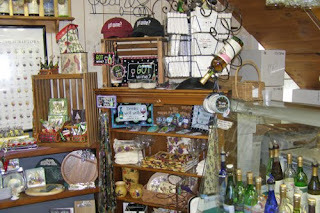 After a quick stop for a small bite of a delicious fudge bar at Joseph’s Wayside farm and a too short look at the waterfalls at Grimes Glen, the next stop was Arbor Hill Grapery. I thought that was an odd name until I met the jubilant John Brahm, master winemaker, cook and all around grape lover. The owner of this complex (winery, bistro, store, tasting house, and vineyard) has not only mastered producing award-winning Rose, Riesling and a host of other usual (and unusual) wines, he has also produced a line of gourmet food products which made the Food Network take notice. He took us through the property and showed us the very unautomated process along the way. Within the shop, you can taste many of the Arbor Hill products, including Amaretto Cream Sherry Wine Sauce, Black Raspberry Celery Seed Dressing and Fiesta Artichoke Spinach Party Dip. Along with that, I tasted the Griesa Hill Iona Rose, with its strong strawberry flavor and the Noiret, a member of the cabernet family that is more of a semi-dry offering with a little black pepper hints. There was plenty more to try, but once again the schedule beckoned and we were off to Sonnenberg Gardens & Mansion. 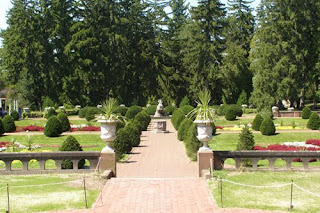 The Sonnenberg Estate, a 50 acre property, was built in 1887 by the Thompson family and is now a State Historic Park. 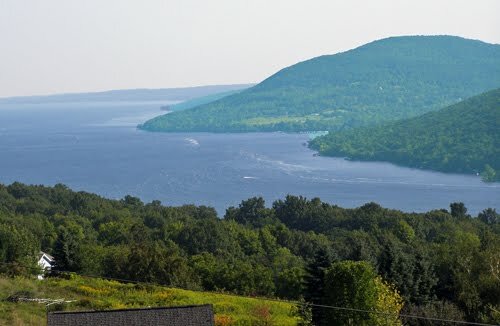 In addition to the beautiful grounds, gardens and 40 room mansion, it also houses the Finger Lakes Wine Center, showing off wines from nearly four dozen wineries in the region. There is a tasting room in the Bay House, which we skipped in favor of a tour of the grounds. There was a wedding taking place (a frequent event here) as Executive Director David Hutchings took us on a mini version of their tram ride along the meticulously maintained grounds.